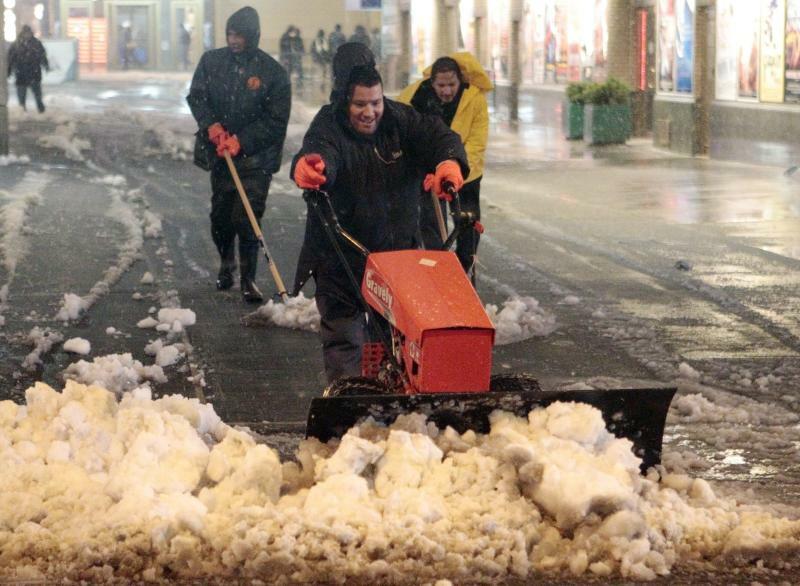 NEW YORK (AP) — The nor'easter, as promised, brought gusting winds, rain, snow and the threat of flooding. It menaced travelers with icy roads, snarled the Long Island Rail Road and knocked out power to people who had only recently gotten it back after Superstorm Sandy. But for the weary, relief is on the way. Joey Picca, a meteorologist with the National Weather Service, says the unwelcome snow and high winds are slowly moving out of the New York City area. 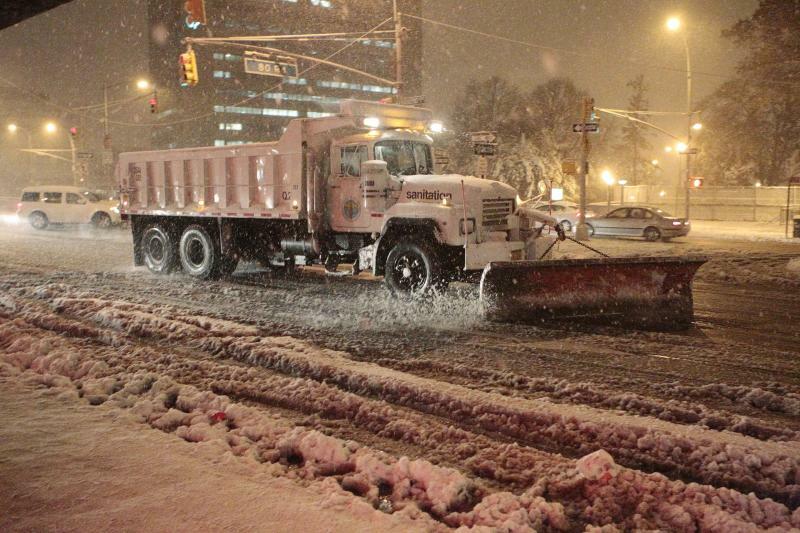 Commuters, though, may have to brave some lingering snowfall Thursday morning. Faced with more bad weather, some in the storm-ravaged Northeast just shrugged, dug in and stayed put. Elena McDonnell didn't waste energy worrying about the newest storm, not after living through Sandy last week and still without power in her Staten Island home. "It isn't scary at all," the 42-year-old said. "This is nothing." Mark L. Fendrick, of Staten Island, shared his frustration with others on Twitter Wednesday night, saying, "My son had just got his power back 2 days ago now along comes this nor'easter and it's out again." Residents from Connecticut to Rhode Island generally got slammed with 3 to 6 inches of snow on Wednesday. Worcester, Mass., had a whopping 8 inches of snow, although a number of other communities threatened to exceed that accumulation. Meteorologist Frank Nocera says all is not lost: temperatures over the next couple of days will be in the 50s in southern New England, and on Sunday it could edge into the 60s. In New York and New Jersey, rain and 60 mph wind gusts Wednesday evening and overnight carried the potential to swamp homes again, topple trees wrenched loose by Sandy, and erase some of the hard-won progress made in restoring power to millions of customers. Not everybody was hunkering down. Katie Wilford was leaving her Brick Township home near Barnegat Bay as the nor'easter approached. She bundled her sons Nick, 14, and Matthew, 10, into the minivan in search of an open motel. "It's a little overwhelming," she said. "I can't believe we're doing this again. We're going on Day 10 with no power. That's a long time. I just want the sun to come out and things to be normal again." In New York City, police went to low-lying neighborhoods with loudspeakers, urging residents to leave. But Mayor Michael Bloomberg didn't issue mandatory evacuations, and many people stayed behind, some because they feared looting, others because they figured whatever happens couldn't be any worse than what they have gone through already. "I'm staying," said 61-year-old Staten Islander Iliay Bardash. "Nothing can compare to what happened Still, authorities urged caution. The city manager in Long Beach, N.Y., urged the roughly 21,000 people who ignored previous mandatory evacuation orders in the badly damaged barrier-island city to get out. All construction in New York City was halted — a precaution that needed no explanation after a crane collapsed last week in Sandy's high winds and dangled menacingly over the streets of Manhattan. Parks were closed because of the danger of falling trees. Drivers were advised to stay off the road after 5 p.m. and part of the busy Long Island Expressway was shut down in both directions because of icing. About 6:30 p.m., the Long Island Rail Road suspended service in and out of Penn Station. By the afternoon, the storm was bringing rain and wet snow to New York, New Jersey and the Philadelphia area. Huge waves pounded the beaches in New Jersey. Firefighters in New York City responded to reports of tree branches falling into buildings, blocking streets and knocking down electrical wires. Forecasters said the nor'easter would bring moderate coastal flooding, with storm surges of about 3 feet possible Wednesday into Thursday — far less than the 8 to 14 feet Sandy hurled at the region. The storm's winds were expected to be well below Sandy's, which gusted to 90 mph. 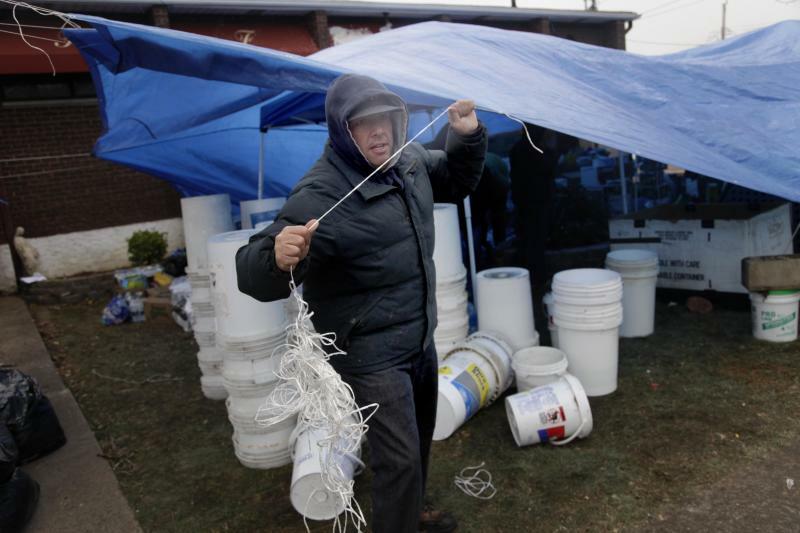 Sandy killed more than 100 people in 10 states, with most of the victims in New York and New Jersey. Long lines persisted at gas stations but were shorter than they were days ago. By early Thursday, more than 292,700 homes and business in New York state were without power, and another 403,000 in New Jersey lacked electricity. In some areas, the numbers began climbing again Wednesday evening. Authorities warned also that trees and limbs broken or weakened by Sandy could fall and that even where repairs have been made, the electrical system is fragile, with some substations fed by only a single power line instead of several. "We are expecting there will be outages created by the new storm, and it's possible people who have just been restored from Sandy will lose power again," said Mike Clendenin, a spokesman for Consolidated Edison, the main utility in New York City. Contributing to this report were Associated Press writers Jonathan Fahey, Tom Hays, David B. Caruso, Meghan Barr, Kiley Armstrong, Jennifer Peltz and Deepti Hajela in New York; Jim Fitzgerald in White Plains, N.Y.; and Angela Delli Santi in Harvey Cedars, N.J. Eltman reported from Garden City, N.Y.